Teaches Kids: Yes - age 10 and up and I love it! Immerse yourself in this cultural yet rustic region of France and take a break from your busy lifestyle. Your host Pierre is an experienced French teacher with a passion for history. Pierre is very knowledgeable when it comes to his region and French culture, and makes a fantastic guide. 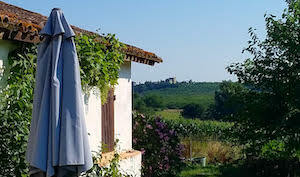 Life in the Tarn-et-Garonne is close to nature: hikes on bikes, foot or horses, cooking with fresh produce, swimming or just hanging by the pool. Reconnect with a simpler lifestyle while improving your French under the guidance of your experienced French teacher. Bonjour, my name is Pierre and I’m a graduated and experienced French native teacher. I’ve been teaching French for over 9 years, starting when I lived in the UK – so I speak English fluently as well. I love history and architecture (I actually own a Masters degree in history) and will be happy to tell you about my region when we visit the numerous castles and medieval villages around here. I also love the art, literature and the movies, so when you come for a French immersion with me, you’ll improve your French language for sure, but also will learn a lot about French culture. During our structured French lessons, I’ll assess your level and focus on your needs and French goals. Through the other activities, during the meals, the outings, I’ll help you develop your spoken French: there’s such a big gap between the French you’ve studied at school and the French we speak everyday! I used to teach in immersion in the Lot-et-Garonne. I recently moved to the right of the map, to an even sunnier region which as several names: Tarn-et-Garonne, or Midi-Quercy. I’m eager to explore it with you! 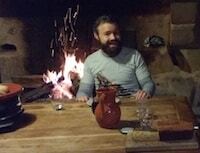 The immersion program I offer is a bit different from the other French Today’s hosts: you will be staying in a cottage called « La Gariotte », very authentic (yet nicely renovated) and built with the local lime-stone. The owners, Monique and Jean-Claude live next door and they will be pleased to meet and have a chat with you (en français bien sûr)! I will arrive in the morning, cook and share breakfast and lunch with you, give you your French lessons, take you around… And after a fun day of immersion, I’ll go back to my own home and my family and let you enjoy some peace and quiet time – or not: should you prefer to go out, there are restaurants in the nearby villages. The house is traditional and very comfortable. In the main living space, there’s a large wood fireplace and a table where you can study and have your meals. There is also a sitting area with large leather armchairs and a TV. The kitchen is fully equipped, which is nice since I really enjoy to cook. 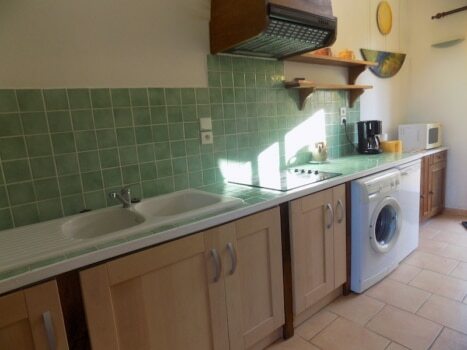 There is even a dishwasher and a washing machine. I like to go to the nearby markets to buy in-season fresh produce, which I use to cook traditional French food. I also like to cook the local specialties like duck and foie-gras, when my students are open to it of course. You are of course welcome to cook with me, and I will be happy to adapt my cuisine to particular diets. I can cook really healthy, mostly vegetarian food or we can indulge with yummy duck… Just let me know what you like. I like to cook savory pies with veggies from the garden, and also crêpes. 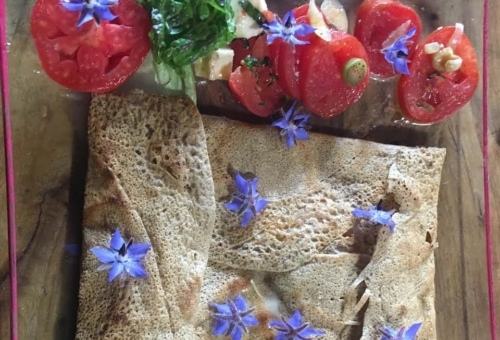 I often use edible flowers: they add a tasteful and pretty twist to any dish! The master bedroom is on the main floor and has a queen size bed with an adjacent bathroom. There is also a mezzanine which can sleep two people upstairs. There is wifi in your room as well as throughout the house. From late-April to October you can use the large in-ground pool surrounded by a marvellous garden with wild flowers. The house is in the heart of nature, at the end of a road, with stunning views over the Aveyron gorges. 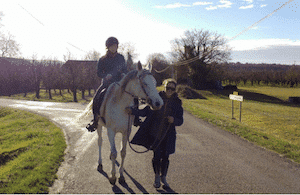 Just across the lane there’s an equestrian center, « Les Bastides », you can go for a ride in the woods. There are two villages nearby: Montricoux (4km) and Bruniquel (5km), with shops , restaurants and cafés, a very traditional market on Fridays. You can reach them by foot (there are lovely footpaths) or by the road (using a bike). If you don’t rent a car I can take you there by car as well. I have a new blended family. My sons Loeiz (17) and Vivien (13) are fluent in French English just like me: you may meet them during the weekends and school vacations. My oldest son shoots bow and arrow, and often makes a show of it when we have kids over: they love it! He is very good and patient with younger kids. 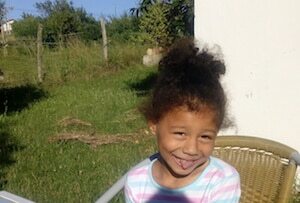 Mélanie, my girl friend and her daughter Abigaelle (9 years old) will sometimes come with us when we go for an outing. Abigaelle is a very lively and communicative girl ! People there are very friendly and are always interested in meeting newcomers – it’s easy to strike up a conversation. The Midi-Quercy is an area of outstanding natural beauty, one of the most beautiful in Europe located in Southern-France. It is still unspoilt, and rural France at its best. At the east end of the Tarn-et-Garonne, Midi-Quercy country has untouched nature plateau, gorges, hills, terraces, wild meadows… Since it’s not far from the Mediterranean, the climate is nice year-round. You’ll see beautiful sunflowers fields in season! Human traces dating back to prehistory, medieval cities, houses, pigeon houses and mills. If you rent a car you can easily get to splendid villages as Saint-Antonin-Noble Val, Cordes sur Ciel, Najac, St Cirq Lapopie: picture postcard villages, classified among the most beautiful villages in France! Right next to us are gorgeous medieval towns like Albi (below) or Montauban. If you are interested, there are also fantastic grottos to visit – although as I already said, we are mostly above ground enjoying all the activities nature has to offer: hiking, rock climbing, horseback or bike riding but also many water sports such as canoeing or kayaking. You’re also welcome to just hang and relax, stay home by the fireplace or in the pool, and read a good book… whatever you may like! Renting a car will be ideal so you can fully take advantage of the region: you can easily do so in Montauban, and I’ll give you links. If you are not planning on renting a car, I will gladly pick you up at the Montauban train station. I could possibly arrange for a pick-up at the Toulouse airport for an additional fee. My house is strictly non-smoking inside. Smoking is tolerated outside in the garden – I myself may enjoy one or two cigarettes a day – my guilty pleasure. I can welcome your pet as long as it is well-trained, quiet and won’t run away. The pool is open, there is no fence around it. Please understand that if you do come with children, it will be your responsibility to watch them carefully. Accommodation in your own house with 2 bedrooms, one bathroom, kitchen, living room. 2 meals a day with me (breakfast and lunch) unless you prefer to take off on your own. 2 accompanied excursions or cultural activities – eg. a visit of some of the castles of the region, or a long hike in the countryside + picnic, a tour of a village + lunch in a simple restaurant – according to your interests. Preferred arrival date on Sunday, departure the next Saturday – but I’m flexible on the days. The price with these options is 1300 euros per week for one person. Euros 700 in half board with shared lessons and excursions. There are other options with more tuition / a longer excursion /no excursion… I am flexible, and can adapt to special requests. My goal is to of course help you improve your French, but also experience a great time in France. You’ll hang out with me and enjoy the breathtaking beauty of the untouched countryside, and relax in the warmth of your French home. 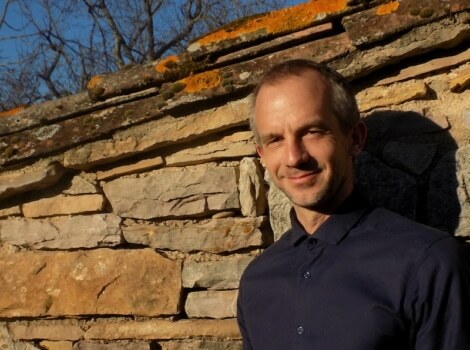 Follow Pierre’s bilingual Articles On French Today, Where He Talks About His Beautiful Region. I wasn’t really sure how this was going to go. It’s been a long time since I’ve been a student. The truth was that I felt equal parts stoked and embarrassed to have forgotten so much French over the years. Much to my relief, Pierre’s style of teaching is what I would call intuitive listening style. He waits to hear how the conversation will go and then follows it. As the conversation goes and the questions come, he follows and then produces whatever conversation, examples, materials for further practice that you need. He is a keen observer of “the pause” for reflection. I felt relieved that he didn’t seem to tire of my many mistakes which he corrected quickly. He made me a galette for lunch with his own crêpe maker. I was so tired from the three hours of intense work that I took a nap before our afternoon hike ! I couldn’t seem to take enough pictures with my newfound knowledge of taking better pics on my iPhone and the gorgeous landscape that surrounded me. After the days activities I was excited to settle down with my first movie of the week: La Famille Bélier. Please note the reviews below come from students who came to my former residence in the Lot-et-Garonne (same river, different region!). I had the pleasure of spending a French cultural & immersion week with Pierre in the beautiful Lot-et-Garonne region this summer. The area was absolutely beautiful; a bucolic countryside dotted with sunflowers, fruit trees, and quaint villages. Pierre lives in a restored farmhouse that was both comfortable and historic. My immersion experience was exactly what I needed and exceeded my expectations. As a French teacher, I spend a lot of time teaching students the basics of French, but I really needed to spend time immersing myself in the language and culture, which this experience provided! Pierre will tailor your French lessons to your specific needs, so no need to worry if you are a beginner or very advanced. We spent mornings outside for our 3-hour lessons and conversations, listening to the birds sing and the occasional rooster crow! Even after 18 years of teaching and a master’s degree in French, I learned so much from Pierre. I returned home with a whole book full of notes to improve my French and my teaching. Pierre has 2 sons who are very polite and easy to talk to. He also has the most loving dogs, Joy & Elouk. Whether we were walking to the local village, Monteton, or taking breakfast on the patio, Joy & Elouk were there to keep us company. We also embarked on an all-day cultural adventure in the Lot-et-Garonne region, where Pierre took me to various villages and drove me through back country roads to witness the splendor and peacefulness of this region. I rented a car for this trip, so with Pierre’s excellent recommendations, I was also able to drive around on my own and visit several regional attractions, such as the Château Duras, Marmande, or the local farmers’ markets. The food at Pierre’s was fabulous, simple and delicious, and I was impressed with the guest living quarters. The bedroom was quite large with a deep tub. All in all, this was an unforgettable experience. I will definitely embark on another French Today immersion homestay in the future. I highly recommend this French immersion experience “Chez Pierre”; you will not be disappointed! Pierre is an excellent teacher. Both his parents were university linguistic professors – that upbringing shows in his teaching skills. Pierre was relentless in correcting my many grammatically bad habits while always being charming, funny, and interesting. I learned a great deal during my week there and plan to return. My husband, a non-French speaker, came with me for the week so the logistics were a little difficult in trying to have a total immersion experience. Pierre encouraged me to translate for Len while he and I spoke in French. Len enjoyed his week too. Every day we took long walks with Pierre’s 2 dogs, Joy & Luke. The countryside is really lovely and interesting and they were great guides. Len & I rented a car and in the afternoons we went exploring. Pierre also took us on several excursions. The most interesting for me was a day of sitting and walking meditation at Thich Nhat Hanh’s Le Village des Pruniers. Another important part for me was the proximity to Le Chemin de St. Jacques. My husband and I have hiked the entire route, Le Puy-en-Velay to Santiago, Spain, except for this one section. This time we enjoyed driving it and Pierre helped us find important historical places (and wineries) along the way. The second week of our holiday was spent with French friends who commented that my French was greatly improved. In October 2018 I had the pleasure of spending a week “chez Pierre” with the aim of enhancing my French vocabulary and comprehension. Based in a relaxed rural environment, it was a stimulating full immersion, which offered constant opportunities both to revisit past learning that had become a little rusty, as well as extend into new territory. Having to converse totally in French prompted the need to think outside the square when trying to find a word or phrase that would convey the general meaning, even if didn’t capture the full subtlety of the concept intended. In our incidental conversations, as well as the more structured sessions, Pierre focussed on introducing me to alternative expressions and vocabulary that would broaden my repertoire, rather than falling back on the well-worn options I have used over years of learning and using French. He was very patient when, for example, I slipped back into my usual “absolument!” instead of “tout à fait!” – and while I didn’t manage to totally shake off such usages, they did definitely reduce over the week through his helpful prompting. Pierre provided a creative range of activities during my stay to promote broader understanding and familiarity with more complex language. This included playing French Scrabble, teaching me the popular French card game Tarot, and nightly exposure to French films (with French subtitles). Our everyday conversations allowed further exploration of French life and culture; and a couple of excursions added some historical insights, as well as tourist enjoyment. The delightful family dogs, Elouk & Joy, were also keen to take me exploring, so I was treated to several walks with them through the adjacent large orchards and woodland that were clearly their familiar territory – a lot of fun! Last but not least, Pierre’s superb culinary skills were a brilliant bonus: meals sometimes reflected his Breton roots and all were interesting, beautifully presented and delicious (I still savour my introduction to the delights of potatoes cooked in duck fat!). All in all, it was a productive and much enjoyed homestay immersion. Merci bien, Pierre! 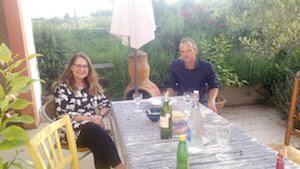 My wife Debbie and I recently spent a lovely week in Lot-et-Garonne working on our conversational French with Pierre. We are both good but not fluent speakers; this was our second experience with French Today’s séjours linguistiques. The bucolic setting, the brilliant sunny weather, and the quiet countryside led to a peaceful atmosphere allowing for hours of immersion in grammatical work. 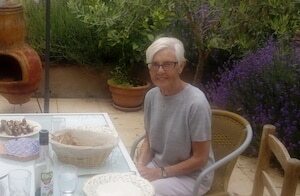 The weather in September was unseasonably warm and we enjoyed most of our lessons and our meals on Pierre’s shaded terrace. Pierre’s two wonderful dogs, Joy and Luc, were our companions when we walked to the neighboring tiny town of Monteton. Luc leads the way, in the photo above. Pierre is patient and supportive and has a very calm demeanor. He also has a delightful sense of humor. We found his excellent knowledge of French history, culture, and language structure to be an added bonus. And of course we enjoyed his delicious cooking. In the afternoon, and with suggestions from Pierre, we made several interesting trips on our own to nearby medieval villages or bastides as they are called (we had rented our own car). 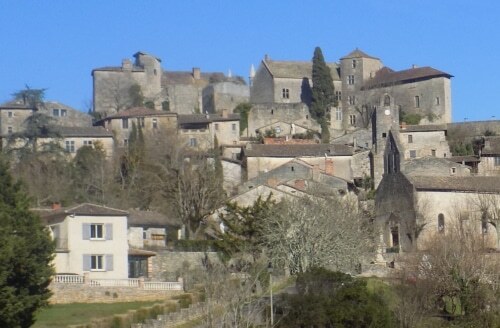 When Pierre drove us to Monflanquin, our favorite village, I was conscripted into being [WAS IT KING EDWARD I??] for an impromptu theatrical / historical tour of the town and the region. Quite an experience as I didn’t always understand what the guide was instructing me to say. 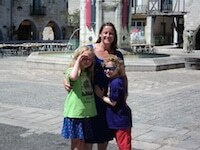 It all added up to a wonderful week and we hope to return to this enchanting and lesser-known area of France. Thank you Pierre! I have recently spent 6 days with Pierre in the beautiful Lot-et-Garonne region, and it was exactly the kind of immersion I wanted! I have just re-started my study of French after a 15 year hiatus, and I knew I needed to commit to an intensive course to kick-start my learning. This immersion provided everything I wanted and more. Pierre was very patient and supportive with me, which was very important as I really had forgotten more French than I could remember. We committed to a full immersion from the very start, and I used English words only when I could not communicate through French. Pierre was very understanding and put no pressure on me at all, and I quickly felt comfortable making mistakes with him and enjoyed his help and guidance. Pierre is a very well-educated, intelligent man with a great understanding of the history of France, the French language and much more. This meant that there was never a shortage of interesting conversation, and I feel like I got a genuine appreciation for France’s culture and history that I had not fully appreciated before. Our lessons each morning were well-structured and I received a quick overview of everything, as well as plenty of time on specific areas I wanted to dial into such as pronunciation. It felt like a couple of months of progress packed into less than a week! 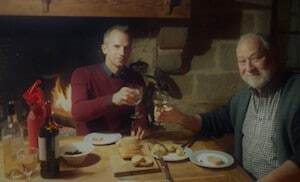 I loved Pierre’s cooking, and looked forward to chatting with him each evening over dinner and wine before watching French documentaries and movies. 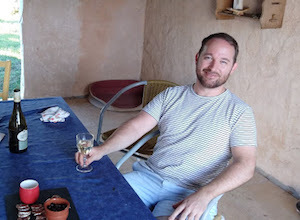 This kind of relaxed atmosphere was very important for becoming comfortable with French again and actually remembering that learning a language, despite being sometimes overwhelming, can also be very enjoyable at least some of the time! 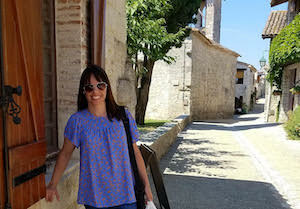 The region itself is beautiful, and our visit to Pujol for the Sunday market was a definite highlight. Pierre’s local village of Monteton is also less than 2km away from his house, so it’s the ideal distance for a light jog or walk when you need to clear your head. Be sure to enjoy all of the wonderful fresh local produce the region offers! Thank you Pierre for all of your time, support and guidance. You’ve given me a renewed sense of confidence in my French, and you have genuinely helped deepen my love for this beautiful language. My 8 year old daughter and I recently spent a week with Pierre to improve our French. We were still jet lagged but Pierre was very accommodating to adjust the schedule and plans as needed to work for us. Pierre was a patient teacher with both my daughter and I. We focused mostly on verbal communication, and in this regard Pierre had a very kind manner to correct errors as the conversation progressed. When asked for further explanation, Pierre was very clear and easily explained all grammar and vocabulary questions that we had. 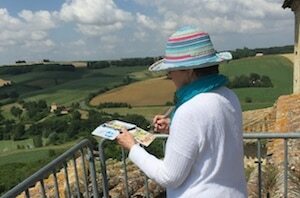 We did many excursions and Pierre was thoughtful to choose kid-friendly activities. He enjoyed showing my daughter his lovely rural property with many pets to brighten her day! We went swimming, walked to the local village, visited a chocolate factory, milked goats, made cheese, searched for eggs, went out for lunch and many other activities. Pierre taught us a lot about this region in France and also patiently explained about French and European history and culture. 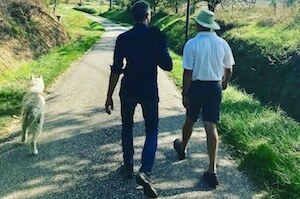 He also offered some locations for us to visit on our vacation time that followed in France. My daughter and I have no hesitation to recommend Pierre to other families of any French level. He is a wonderful host, talented chef and an excellent teacher! Merci Pierre! 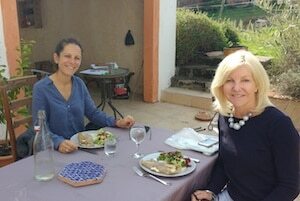 Our stay at Pierre’s home was the high point of our two-week trip to France! 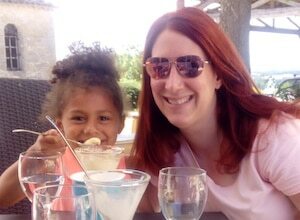 I looked around for an immersion homestay for my 5 yo daughter and me, and our time in Lot-en-Garonne exceeded our expectations. Pierre was accommodating with reservations and our travel plans. He met us right at the train station, and for the next seven days, my daughter and I didn’t worry about a thing! Words don’t do the beauty of Pierre’s property justice. The view from his property is breathtaking, and my daughter and I enjoyed our days walking to the village, swimming in the pool, dining on the patio, and playing outside. I appreciated how Pierre provided separate lessons for my daughter and me. His expertise as a French language teacher was evident from our first lesson! After one week, we both significantly improved our French. I moved from being hesitant about speaking solely in French to talking in French at restaurants and on trains. My daughter was spelling in French and singing French songs. And, thanks to the homestay immersion, both of us are continuing our lessons upon our return home to the States! Pierre also is a gourmet cook, and my daughter was happy to assist in helping him in the kitchen. Breakfast, lunch and dinner all were delicious and made with many ingredients from his garden. Oh, how we miss his homemade blackberry jelly, galettes and pain de poisson! My daughter has an allergy, and he gladly cooked with our dietary restrictions in mind. Since our return to the States, my daughter regularly asks me if we can go back to Pierre’s house next summer. It is a truly magical place, and we both hope to visit again! Please note that since the reviews below, Pierre and his wife Isabelle are separated. His two sons live with him part-time. As I began to study French more seriously last year, my goal was to converse in French. 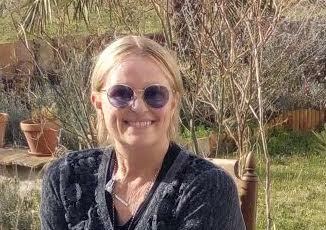 I’d spent a week in Aix-en-Provence several years ago and discovered that after years of classroom instruction, I was not able to speak or understand much, except to ask for directions or order in a restaurant. 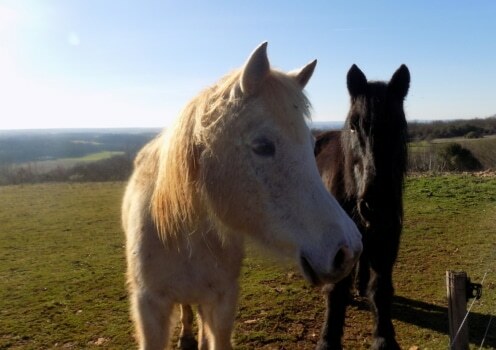 I was looking for an immersion experience, but not in a classroom, when I came upon Frenchtoday.com and found Pierre and Isabelle – French lessons, beautiful country, and horses! What could be better? I thoroughly enjoyed my week and learned so much. The setting is absolutely stunning and there is so much to see within a short drive. After a day of sightseeing with Pierre on Sunday, we got to work on Monday and every morning for the rest of the week. Tailoring the lessons to my level and objectives, Pierre and I focused a great deal on the words and phrases that make conversation fluid, much of it not to be found in a text book. Serious study, but a lot of fun, too. And it truly was immersive, we spoke French the whole time with only one or two exceptions to clarify the meaning of certain expressions. 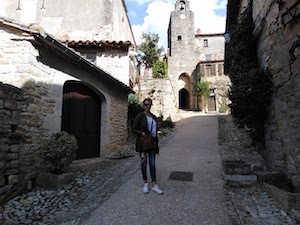 In the afternoons I relaxed, did homework, took a walk, or visited a castle or bastide village. I loved the villages and the countryside and had the opportunity to visit Monpazier, Eymet, Issigeac (which I misunderstood to be Ici Jacques – haha), Tourtrès, Castillionès, and Lauzin. But it was actually residing in a home – a wonderfully restored farmhouse – with a French family and their animals that made the experience so special. And Pierre’s cooking is superb! A week is short for study, but I came away with much improved comprehension and the tools to improve my conversation skills more rapidly. I highly recommend a stay with Pierre and Isabelle in Monteton. I’ve been studying French for a while and was struggling with my confidence to speak. 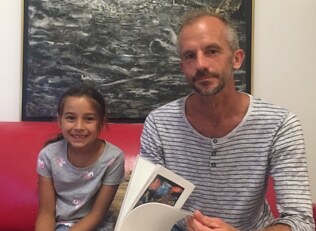 After spending 2 weeks with Pierre and his lovely family in the Lot-en-Garonne region of France I certainly gained a lot more confidence and felt reasonably comfortable with my ability to make myself understood in situations such as restaurants and shops. The area around Pierre’s home is very picturesque and weather permitting the walks either into the nearby village of Monteton or through the orchards were very enjoyable. The family’s two gorgeous dogs were more than happy to accompany me and their delight was a joy to behold. There is a lot to see in the surrounding area and visits to the castle at Boneguil and Chateau Duras were very enjoyable. The nearby town of Marmande has plenty of shops and restaurants if you feel in need of a break from the quiet countryside. Pierre is a very patient teacher and very thorough covering a wide variety of grammar topics. There is plenty of time to practice your french and the immersion experience of listening to “normal” conversations certainly helped to improve my understanding of the spoken language. I stayed with Pierre and his family for one week in June 2018 to improve my French conversation. Pierre is a dedicated teacher from whom I learned both grammar and conversation skills. 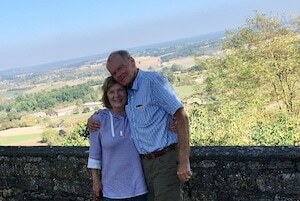 On several trips in the beautiful Aquitaine countryside he showed me some of the villages, bastides and views of the area. 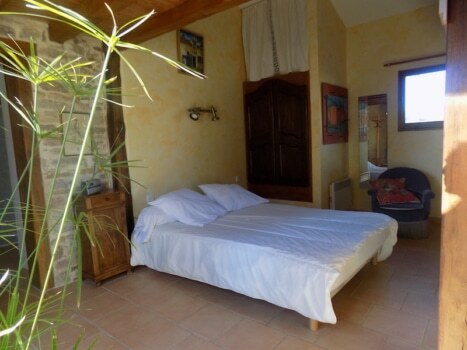 His home is comfortable and welcoming, located in a very tranquil spot near the village of Monteton. In addition he made some excellent meals! 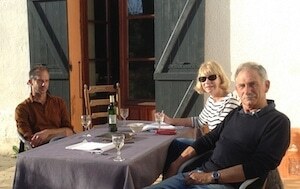 My husband Wayne and I have just completed a week of Immersion French staying with Pierre and his family. Despite the weather being changeable, Pierre was able to introduce us to the history and lifestyle of the area where he lives. Coming from Australia, as we do, it was a big adventure for us. Because Wayne and I have different levels of French, Pierre was willing and able to take this into account as he organised our conversations and grammar lessons each morning. We both felt that we learnt a lot and felt free to ask questions to ensure that we understood what he was teaching us. We worked together in every session. Our formal lessons went for 3 hours each morning, following on from the previous day’s study. We always began by reviewing our written homework, which consolidated the new work which we had focussed on the previous day. This proved to be very effective and enjoyable. 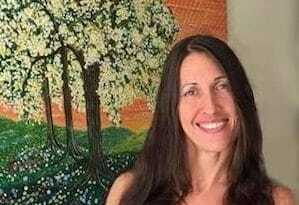 As I have been teaching French at Beginner to Intermediate levels, in Australia, I had an advantage with written work and an ability to read French, while my husband has an interest in languages, but has not studied French for many years. But we both found the emphasis on conversational French, in particular on commonly used conversational expressions, was particularly relevant and useful, but also a challenge. When we were not being taught formally, Pierre was keen to participate in general conversations in French, with us, while we were sitting around the table, at meal times, playing French scrabble or generally relaxing while taking a walk with Pierre and his dogs. He also invited us to a friend’s birthday party which was a special opportunity to speak French in a social situation, with others. As well as this he took us to some local bastide villages and showed us examples of the history and architecture, as well as telling us about the picturesque rural countryside in this part of France. Pierre prepared meals for us, including breakfast, lunch and dinner, showcasing vegetables from his garden and food that was prepared for his family as well. In the evenings he asked if we would like to watch French movies or documentaries, which we did on a couple of evenings. Although the week was quite mentally exhausting, it was stimulating as well. We enjoyed the contact with his wife Isabelle and two teenage boys, as well as their dogs and cats. We would definitely recommend the experience to others keen to refresh or cosolidate their understanding of conversational French and the rules and reasoning behind the structure of French language. Pierre was always readily approachable and keen to help us to benefit from the experience. This is probably the best French instruction I’ve ever had, a course in all things French. Not only in language, it’s instruction in French culture, history, architecture, film, cooking, traditions of wine and cheese, and the making of prunes. So much is here. You can even ride horses. During our two-week visit, Pierre took us to the local marché to get oysters, Marmande tomatoes, and regional strawberries like garriguettes, explained the making of traditional homes with columbage, taught us to make galettes bretonnes with a fresh egg from his chickens in the middle, fed us tomatoes and salads from his garden, made and cooked tartes and quiches, everything en français from the moment we emerged in the morning through French films (with subtitles in French or English) until bedtime. Pierre modified his usual total immersion for us. 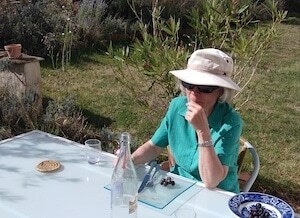 My wife Shirley, who doesn’t do much French, enjoyed her free time – no phones ringing – to read, walk, and take pictures, and joined in after the lessons and at dinner. She felt totally included as well in this French family. We were lucky to visit at the time in late April when the pruniers (plum trees) in the surrounding orchards were en fleur. The large orchards were beautifully dressed in white just for about a week, contrasting with the bright yellow colza and the huge green fields of wheat. 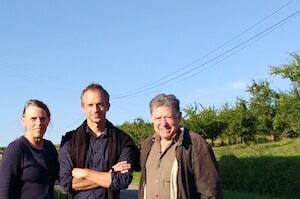 We were surrounded by vineyards, and we enjoyed wines with AOCs we had not known of – Cote de Duras, Cote de Marmande. 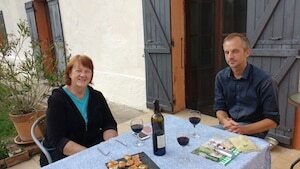 Pierre took us to the local maison de vin in Duras to try local wines, wines that we cannot get in the US. He took us on excursions, one to the local Château de Biron, and to surrounding towns. and on other days we went on our own to the Château de Duras and to nearby bastides and brought back oysters from the Bassin d’Arcachon or La Rochelle from the nearby Atlantic coast. Pierre is a scholar of French language as well as of English. 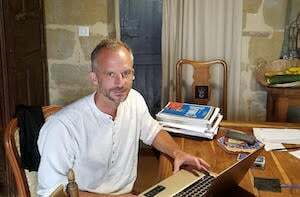 He knows the origins of words and the reasons for the peculiarities of the French language that make it so difficult for anglophones, and he has a seriousness and gift of lucid explanation that helped me to better understand the structure of French. And it’s all geared to conversation – what you say, what people really don’t say, and when, a great help to my efforts at conversation. Not to be missed. 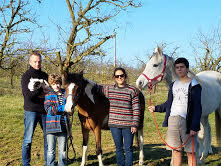 In February, I stayed with Pierre and his family for a week in their charming farmhouse in Lot-et-Garonne. I am a retired prof. seeking to improve my French and the week studying and chatting with Pierre was incredibly enjoyable and informative. We would have formal sessions for three hours in the morning addressing a variety of conversational and grammar questions. We also did some local trips. I went with Isabel to see one of her horses get shod, a first for me! Eating with the family was most enjoyable and delicious. In the evening, we would often watch French films, with French subtitles, which was terrific. We played some games, a card game called Tarot with Pierre the elder boy Loeiz, also scrabble at which Pierre is a wiz. I will be returning for a week near the end of August with my 14 year old grandson who loves studying French at school and does well at it. 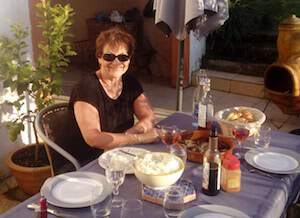 I look forward to being with Pierre, Isabel, Loeiz and Vivien again and working with my grandson on la langue francaise! I recommend the experience very highly. Pierre and his family were a joy to stay with. I arrived in Marmande on a train from Bordeaux and Pierre was right there on the platform waiting for me when I got out. Although I was nervous about my level of French, Pierre was very kind and did his best to always help me understand. He brought me to their house and I was able to unpack my things in a large room with a beautiful bathtub. Pierre was very attentive and taught me how to play a classic french card game on my first afternoon. The rest of the family was very sweet and kind. I was there the week before Christmas and spent lots of time by the fire sitting next their adorable dog named Joy and reading and studying. In the week I spent there, I ate incredible food that Pierre made, visited several different old castles, and learned lots of French. 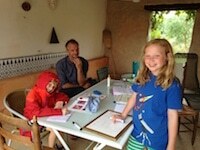 Although the morning French lessons were three hours long, Pierre was very engaging and they went by very quickly. He did his best to tailor each session to my French level and my needs. Every night I was able to watch a French film with the family which extended the amount of French I was able to take in every day. Isabelle, Pierre’s wife, is very sweet and one sunny afternoon she took me out for a horseback ride through the town which was such a lovely adventure. It was such a pleasure to experience life in Lot-et-Garonne and have the time to really work on my French, gaining a better understanding of the level I’m at. I was in France this year for 2 months and I spent a week with Pierre and his family in October. I had a wonderful week there and after some very very hectic weeks with friends in Paris and other parts of the beautiful Dordogne Valley and Bordeaux, it was so nice to wind down a little in this peaceful and picturesque environment. Pierre is such an excellent, patient and thorough teacher of French and the lessons on pronunciation were invaluable. I am also beginning to really understand the subjunctive – yay – at last!!! Thank you Pierre! I really understand now that the french language is never going to be a direct translation, and Pierre opened my eyes up to this and since i have been back in Australia i feel that this has influenced my learning enormously. 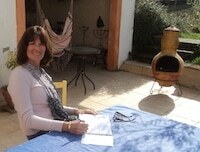 I have come home ready to plan my next trip to France to keep learning and experiencing. I absolutely loved the countryside where Pierre lives. I borrowed a bike one day and rode to a neighbouring village and I thought i was in a picture book it was so pretty. One day I spent an hour or two wandering the cobblestone tiny streets in Duras and stopping for a vin blanc for a delightful little cafe and conversing with the owner in French. 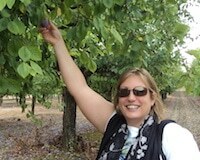 Now I am back at work in Melbourne and spend part of each day daydreaming about my time in Monteton! Thank you Pierre for a wonderful experience and I hope to meet again. I spent a great week with Pierre and his lovely family at the beginning of October 2017 and it was everything I had hoped for. I live in Canada (a native English speaker). I have been working fairly consistently at improving my high school french over the past five years and have managed to reach a C1 level. Having previously enrolled in several French immersion courses in France for adults, which were all superb, I decided that this year it was time to try something new, and perhaps a bit more intense. The bucolic rural setting, the farm, the family and pets and the accommodation provided were all lovely. It was the perfect opportunity to relax from a faster pace of life and at the same time study hard. Pierre is an exceptional teacher and customized our daily morning grammar lessons to my needs and often taught me things that one cannot find in text books and also gave a slightly different perspective on some of the more difficult grammar points which were invaluable. The opportunity to be completely immersed and to speak only in French for a week makes a significant difference to ones fluidity of speech. On our visits to neighboring Bastides and on our country walks with their dogs Joy and Éluc, Pierre shared his passion and knowledge of the local history which was fascinating. It was an invaluable experience! I stayed with Pierre and Isabelle for 10 days in early September this year. I thoroughly enjoyed my stay with their lovely family. If you are looking for a very quiet place to study and learn, with a great deal of one-on-one attention, then this is the place for you. Pierre quickly figured out my strengths and weaknesses and tailored the morning lessons to my needs and then assisted me through the day in my attempts to communicated in French. I read French fairly well but never had any education in speaking it. This experience gave me more confidence and Pierre taught me many present usage constructions which were quite helpful. The videos in the loft were great and I am committed to getting more French language films at home as I think that really helps the learning process. I have watched some films in the past with English subtitles, but Pierre’s films had French subtitles and the difference was amazing for helping me to think in French. Pierre goes out for fresh food almost everyday, as well as utilizing fresh vegetables from the garden and the meals were very tasty and healthy. I have a gluten intolerance and a couple of other food allergies, and he was extremely accommodating. The accommodations are large, airy, private and very clean. I also enjoyed the children who are extremely well-behaved and friendly. The dogs and cats and horses rounded out the family experience beautifully. I awoke at 3 AM at home in Denver and started conjugating, “je devrais, j’aurais dû, je pourrais, j’aurais pû…” This is the result of jet lag plus a week of immersion training with Pierre: the lasting desire to speak French! Honestly, I had no idea what to expect when I bought my plane tickets and wired my deposit. Could I spend a week speaking French? Was this a big mistake? Did Pierre and Isabelle exist?! Happily, they do, and this was a fantastic experience – difficult and a little stressful because it’s hard to learn a language as an adult, but overall I am inspired to keep trying. The location is rural but if you like gardening and starry nights and plenty of animals, you will feel at home. The house pets are incredibly friendly and I enjoyed walks through the plum orchard with the dogs, as well as some unsuccessful but adventurous mushroom-hunting. The chickens and the horses are just outside your door. In season, you can pull figs, apples, peaches and plums off the trees. 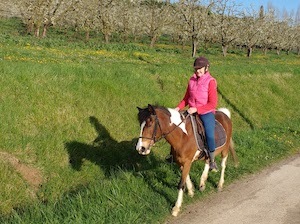 Isabelle and I generally spoke about our mutual horse passion over a glass of wine before dinner, and their good-natured kids seemed unfazed by yet another stranger mangling their language. Meals often featured vegetables directly from the garden, like potatoes, beans, and delicious tomatoes, and I always felt well-fed. The bedroom is large, sunny and quiet, and seriously, I slept better than I do at home. But it boils down to Pierre: not to make him blush, but he is extremely kind, calm, knowledgable, interesting, welcoming, and super-generous with his time. Je te remercie mille fois, Pierre! 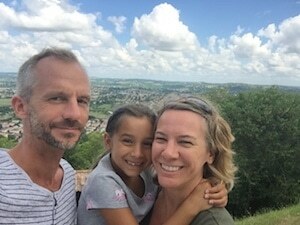 My 13 year old son and I visited Pierre and his family this summer with the hope to improve our spoken French and to spend some time away from city life. The place where they hosted us is a charming remodeled farm house in a very peaceful rural setting. The nearest village is Monteton, about 10 min bike ride in a landscape reminiscent of Van Gogh’s paintings. The family was very sweet to land me a bike and it felt neat to peddle up the route often taken by Tour de France cyclists. The stay with the family itself was a true delight. They were super accommodating and attentive to all of our needs and whims, be that food, activities or lesson times. They went out of their way to make us feel comfortable and even arranged for a game of tennis for my son. We loved the opportunity to ride their horses, the sightseeing trip, the visit to the grotto. Pierre is a professor of French and fluent in English which makes him the best teacher one can wish for. He accommodated my son and I for separate lessons, regardless of the fact that this was somewhat challenging on his schedule. Due to the fact that Aylor and I were at different levels in our learning of French this worked great for us. My son and I had a great experience and my son already voiced his wish to return the following summer. 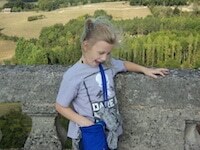 I recommend Pierre’s immersion school to anyone interested in combining learning and traveling for fun. My week with Pierre and his family was one of the outstanding experiences in my life. I was very relaxed and learned a great deal in the morning classes, with the opportunity to practice the rest of the day in the immersion homestay. 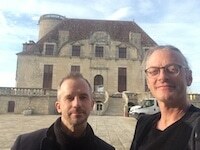 Pierre assessed my strengths and weaknesses in French during the weekend I arrived while we visited the Chateau de Biron and local small towns. He then organized my class specifically for me. Accommodations in a private room with private bathroom are excellent. I enjoyed meeting and speaking with Pierre’s lovely wife Isabelle, as well as meeting his two children and the friendly dogs and cats. Although I didn’t take advantage of riding Isabelle’s horses, I enjoyed watching them in the field. Pierre is an excellent cook in addition to being an excellent teacher. We had simple delicious meals prepared with fresh local ingredients. As an artist I appreciated the lovely setting of home and countryside. Meeting a few local residents with the opportunity to have more French conversation was also a plus. I can wholeheartedly recommend this immersion with Pierre and his family for anyone at any level of French. For me, it was a very special and unforgettable experience. 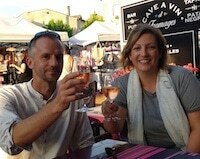 My husband and I just returned from a wonderful experience with Pierre and his family in Lot en Garonne. We had not done this type of immersion before and we were a little bit nervous about this “French adventure”. But it turned out to be one of our best vacations and an extremely positive experience, both for advancing our french language skills and for understanding french culture and everyday life. Pierre and his family were warm and welcoming hosts. 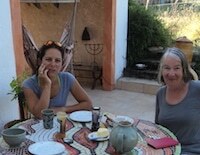 We enjoyed our regular morning classes as we sat together at the kitchen table, sipping tea and speaking French. Then we could relax in the afternoon in this tranquil, country setting. The calm and unhurried atmosphere of their home seemed the perfect environment for learning. We appreciate so much all Pierre’s effort – not to mention his culinary talents! – to provide an unforgettable week. We are sure to repeat this experience again. It was with some trepidation that I arrived in Bordeaux in mid-march 2017. After all, the arrangements for my one week stay were all done online – would my expectations be met? I had flown from Perth in Western Australia and my knowledge of the French language very basic, and the way of life vastly different. My week was wonderful! Pierre and his wife Isobel and their two sons were so easy to get along with and could not have made me feel more comfortable sharing their beautiful rustic French farmhouse with attached stone barn. We spent three intensive hours every morning between 9 – 12 noon. I am in my 60’s but Pierre is extremely patient and has the best sense of humour that I have ever encountered in France. This is the way to really learn “the French way” and I would advise anyone, any age, to participate in an immersion experience. Your language skills will improve in a short space of time AND it is enjoyable! This was a joy and I learnt so much about how a typical French family living in a rural area conduct their daily life. I had the opportunity to be included in all activities and encouraged to ask any questions about anything. Pierre is a brilliant cook and the food is so good, healthy but yummy, and our dinners were something I looked forward to every day. Any food/drink preferences were well catered for. You are encouraged to converse in French but if it gets too hard your native language is ok. Very fond memories of sitting next to the fire, eating, drinking and talking. Lovely, very large with bathroom, good storage, great views, excellent heater, comfortable bed and private, as away from other bedrooms. The house is full of character and situated in a beautiful farming area amongst prune orchards. Pierre took me to several interesting places and areas. Sunday there are no French lessons so Pierre took a me to a lovely town where we wandered through the street market, had a fantastic restaurant lunch – oh the duck, highly recommend. Then to Chateau Biron which is a definite “must” then on to many other sites, all very French and highly recommended. This was a great day! Some afternoons we visited other sites of interest as well as THE BEST chocolate shop; I am a chocolate connoisseur and this is as good as anywhere in the world. Isobel and I share a passion for horses and both have our own hoses and ride frequently. Isobel was so obliging and we were able to have a few “horse” experiences. In April I had the good fortune to spend 2 weeks with Pierre and Isabelle. My experience could not have been better! The Dagrons are incredibly friendly and laid-back. The warm welcome and genuine hospitality made me feel “at home” from the very first hour. My goal was to speak French tout le temps, and that is exactly what happened at Chez Dagron. Pierre completely focused on my oral skills. 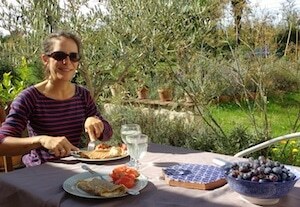 The “learning” went on all day: from breakfast until bedtime, I was able to converse and improve my French. Living with a family in a beautiful rural area was a bonus, and I’m grateful that Pierre and Isabelle shared their daily life with me. The presidential race was in full swing so there was much to discuss. Movies at night, excellent excursions to markets, villages and chateaux…I was never bored and the time flew by. I even learned to play Tarot (tres amusant, although I was toujours la grande perdante). The accommodation is very comfortable with a good bed and lots of light. Pierre is an excellent cook and all of the meals were fresh and delicious. It was a delightful experience and I can’t wait to return next year! 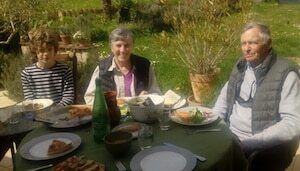 “I am glad to have done this immersion homestay with Pierre and Isabelle’s family. It was truly an unforgettable experience. Living a French way of life in the countryside would not be possible if I were just visiting France as a tourist. So I thank Pierre and his family for welcoming me into their family. I enjoyed every aspect of my stay. The ambiance was calm and peaceful. Their house is beautiful. The bedroom is as depicted in the photographs. Pierre cooked healthy food with fresh local produce (salad and olives from his own garden!). I actually ate healthier and slept better at their place than at my own home! Pierre has helped me to get over a language-learning plateau. He pointed out my weaknesses and addressed those grammar and pronunciation topics during the morning lessons. I also appreciate that he highlighted certain grammar and usage that are frequently deployed in French. That was very useful. I am now more ready to express myself beyond very simple sentence structures. I also feel that my ears are opened up and I understand a lot more than before. Even my regular French teacher at home noticed that I speak French faster and more fluently now. We have been taking a French course every week (1.5 hours) since we moved permanently to Finistere from the UK four years ago, but we felt that we were not making enough progress. We did not have the confidence to speak French when we had the opportunity and we were finding grammar and pronunciation particularly difficult. We felt that a week of intensive study tailored to our own requirements would be the best way to make more significant progress. On the Saturday afternoon and Sunday at the start of the course Pierre took us on visits to two chateau, a Sunday market and another very nice old village where we had lunch. It was an excellent way to break the ice and prepare for the week. During the week of lessons we covered a lot of grammar, pronunciation and verbs in particular but just as importantly we were able to practice speaking French in a relaxed environment where we could have our mistakes corrected. Throughout the week we had many interesting conversations during lunches and dinners with Pierre and his family, who could not have made us feel more welcome. In the evenings we had the opportunity watch French films, which we were then able to discuss the next day. We became much more confident with conversations as the week progressed. Although the course was quite intensive, every aspect of the week was also very enjoyable and it was just an excellent and relaxed learning environment. We certainly believe that our French has progressed significantly and in particular we are much more confident when writing, reading and speaking French. We have a lot more confidence that French people will actually understand us! We would definitely recommend the course for those who want a holiday with a difference and wish to significantly improve their understanding of the French language in a short time. I was happy to spend a week with Pierre and his family in February 2017. I was a little apprehensive at first as I never done anything like this before in my life. This was completely out of my comfort zone. Pierre knew that my weak point is speaking and understanding the french language. Even though I have been studying for years , I have been studying written french which is really quite different. If you really want to live with a french family and learn their way of life and push yourself to the next level, I would highly recommend a week or longer with Pierre and his family. The area is really lovely with orchards of plum trees, hazelnuts, along with sunflowers and wheat fields. Even in February the wheat is really green and looks like a lush lawn. Their life is simple compared to my crazy hectic life in Connecticut. Every morning we started with traditional french breakfast with homemade prune jam followed by a structured lesson for about 3 hours, although the whole became a lesson because I was interacting, having to pose questions and for me, my biggest weakness, comprehension. The whole family made me feel at home. We watched french films with french subtitles which really is a useful tool for comprehension and reading french as it is spoken. I really enjoyed our evenings in their loft with their home theatre and big screen. 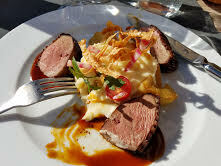 We went on two different châteaux and a wonderful medieval village.We ate outside a restaurant here where I had the best duck breast I have ever eaten in my life ! Pierre also drove some the cute villages along the way so that I could see them. It was a wonderful day ! I learned so much in this one week stay with this wonderful family (I also made good friends with the dogs and the cats). My french teacher at home even noticed the difference in my confidence in speaking. I would love to return for another visit ! 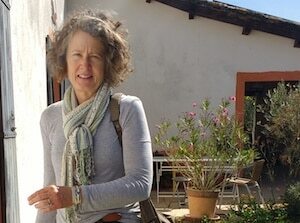 Frustrated by my lack of progress in speaking French, we searched for an authentic French experience, where we would be encouraged and abetted in our pursuit of the French language. Pierre, Isabelle and their two boys welcomed us into their family, not to mention the menagerie of wonderful pets and animals on the farm. What could be daunting, to take up residence with strangers, the Dagron family made a completely warm and welcoming experience. Pierre’s lessons and his never ending patience allowed my husband and I to improve our French. We had a formal two hour morning lesson, followed by a day of French conversation learning idioms as we went along. We shared afternoons and evenings in conversations, covering film, culture, politics, food. The surrounding countryside was lovely, the food simple and delicious, and of course, the wine. Throw in a chateau or two and you have the total experience. My first night home, I dreamt in French, so, the experiment was a success. I spent three weeks at Pierre and Isabelle’s charming country home. Pierre instructed me in a full French language immersion course over those three weeks. I was attempting to increase my level from basic to working French. I had tried several different methods and another instructor before I arrived, but consistent immersion in the language is the best approach. We covered the majority of the subjects needed to accomplish my goals. The course was well structured, with formal lessons mixed with topical conversations, and informal discussions and learning in the evening. It was quite intense. I left with plenty of topics to continue to review and study. Most of all, I gained some confidence in regular conversations in French. Pierre would continue to remind me of my weaknesses so I could correct as we had covered. The location is ideal for intense learning. I was able to concentrate easily, with few distractions, and enjoyed the afternoon walks among the prune trees of the area. Pierre was flexible with my learning style and goals. Pierre, Isabelle, and their two sons, were incredibly welcoming to me. They invited me to become a part of their daily routine, including meals, going to the market, and evening films in the loft. It was a pleasant three weeks. Hopefully I can do some work in French soon, and if I ever need a refresher course, I will return to Pierre without question. Thank you to the entire Dagron family for a memorable stay and some actual progress in my French! I had a wonderful week living with Pierre and his family in early December, 2016. Pierre met me just outside the arrivals area at the airport in Toulouse, and I knew right away that things would be just fine, despite my anxieties about meeting and living with people I had never met, along with my level of French comprehension and expression. I felt welcome and comfortable. I received far more instruction and attention than I expected. Everything seemed interesting, and I wish now that I had been able to arrange for a two week stay, I was a little sad to leave! 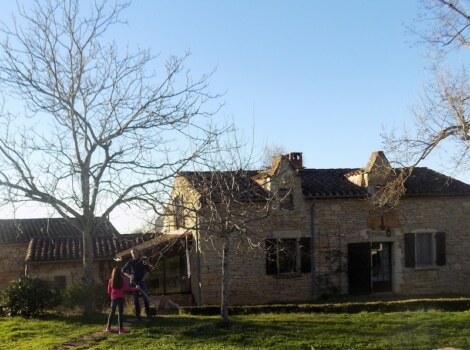 I loved the family, the old farmhouse, the countryside, the several warm sunny days (in December!) when I could take a break on the patio with a coffee, observing the antics of the animals. I expect I will arrange to return again for another immersion experience, because the week really kick-started my interest and resolve in learning French, and getting to know France! I recommend Pierre without reservations! Thank you Pierre and family! If you are looking for the perfect conditions to improve your French in the perfect setting, you won’t find a better than being welcomed into Pierre and Isabelle’s home. The relaxed environment allowed me to enjoy learning both in lessons with Pierre as well as speaking over wide ranging topics of conversation during the rest of the time in the French countryside…also if you love film there is no better place to stay with their depth of knowledge and a wonderful home created mezzanine cinema. 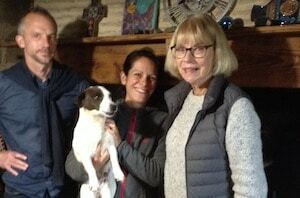 Exploring around their home and the towns and castles in the area only added to the experience and both Pierre and Isabelle were on hand for anything you could possible need….they also have the friendliest dogs I’ve ever had the pleasure to meet. 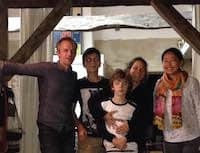 I enjoyed the food and company served up on an unforgettable week that has acted as a fantastic launchpad to really progress in French…I can’t thank the Dagron family enough for a memorable stay. My husband and I recently spent a week with Pierre and his charming family. We were a little apprehensive at first, but Pierre quickly put us at our ease. His impressive command of the English language enabled him to explain French grammar and commonly used phrases in a clear and interesting way. We were made to feel very welcome and comfortable in Pierre and Isabelle’s home. All our meals were prepared for us and they were well cooked and wholesome. Meal times were spent “en famille” when we often engaged in lively and amusing discussions. and to a wine exhibition, followed by a wine tasting. These trips gave us the opportunity to practice our French under Pierre’s expert guidance. A thoroughly enjoyable and useful week. We now feel far more confident in speaking French on our frequent trips to France. I wanted to start learning French to further my work opportunities for the future. I arrived at Pierre’s with only a few words and phrases I picked up from movies and an app on my phone. Within the week, I learned so much, from beginning to understand grammar to different pronunciations and learning a great deal of new vocabulary. I enjoyed the whole experience, from the structured learning time to the trips out and about, seeing the beautiful area surrounding Pierre and Isabelle’s home. I felt very much immersed in Pierre’s family and it was a delight spending time with Pierre, Isabelle and their two boys, Loeiz who is very sensible and Vivian who is super cute. I really appreciated learning French in such a joyful way. Thank you Pierre and Isabelle. I stayed with the Dagrons for a week not entirely sure what to expect. My French was not even basic and I started to learn new words the moment Pierre picked me up from the airport. By the time I left, I was able to dictate conversations and was responding in French without thinking. Pierre figured out my weakness straight away and focused on bringing up the level with patience. He also recommended me some material so that I can keep working on it after I left. I had a wonderful time hanging around and following the normal daily routine. Being away was already a treat for me, and I am so glad that I decided to spend the week with them. We have had a wonderful experience here with your family ! Thank you for opening your home and your hearts to my daughter and I this week. Your kindness and hospitality knew no bounds. We can never repay that, but our home in New-Orleans will welcome you. I spent a very happy week with the Dagron family improving my French and enjoying the beautiful countryside and relaxing life of summer in Lot et Garonne. I was made to feel very welcome by the whole family, including the animals. A highlight of my stay was learning to play the French card game tarot – lots of fun. Pierre cooked us delicious meals with produce from the garden. The tomatoes were really good and the grapes were the best I have ever tasted. We went for lots of walks and visited some pretty villages around the area. We also visited an old water mill and learnt quite a bit about the history of the waterways and the region. Pierre is a very good french teacher. He was good at finding my weaknesses and I finished my week with much more confidence in speaking French than I had before. I’d love to return next year to renew my acquaintance with the family and further improve my French. Merci à tous. This is my second visit with Pierre and his family. The first time, I learned the sentence structure and started pronouncing the words and phrases. This time, I heard the differences in all the sounds. My pronunciation has gotten better. I’m also able to form and say complete sentences. My understanding is getting better and will come with time. The experience with Pierre isn’t only about the classroom lessons: it’s also about meeting people and understanding the local culture. This time we met Jean-Pierre and learned about drying plums to make “des pruneaux”. Looking forward to returning next year. A bientôt ! 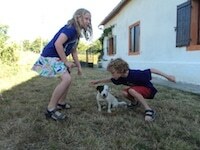 My two children (aged 7 and 9) and I stayed for 10 wonderful days with Pierre and Isabelle and their family this summer. I had been a little apprehensive about organising such a trip online. I needn’t have been. Pierre and his family couldn’t have been more welcoming and generous in their hospitality. Pierre and Isabelle really went out of their way to make us feel part of the family, and the children had a lovely time with Vivien and Loiz. 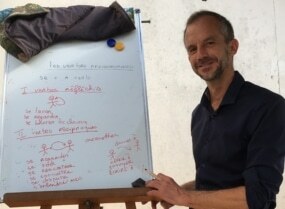 It is quite a challenge to teach holidaying children French – but Pierre handled it brilliantly, devising really fun ways of learning French that engaged even my 7 year old. It was great to be out and about too with Pierre and the family, visiting local castles, and festivals, horse riding and canoeing too. I hadn’t thought my school-girl French was salvageable but it improved dramatically thanks to Pierre and Isabelle’s patience. It was a such a pleasure to get to know them all. Thank you for a really wonderful stay. I decided to learn french earlier this year. I have made several trips to France and I didn’t like the fact that I could only say « Bonjour » and « Bonsoir ». I met a French colleague of my husband’s who inspired me to learn the language. I currently can speak italian with enough to get by. I knew that italian and French are Latin based languages ; however I didn’t realize how closely the words are related! I arrived at Pierre and Isabelles’ house thinking that I didn’t know much. Pierre realized that I knew more than I thought! He made me see the connections and « Voilà ! » my vocabulary increased greatly. His family is very considerate: his boys are well behaved and quiet by my standards. His animals, the dogs, the cats and horses added to the country ambiance. Pierre prepared three meals a day using fresh ingredients from his garden or the local market. I came to his house thinking that I would only learn a few basic phrases and I have met with so much more than that!